Hydroflex Systems offers stainless steel heat exchangers as well. 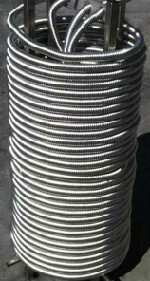 They are manufactured from 316L, corrugated, helical stainless steel. While stainless stell has a lesser coefficient of heat transfer than copper, the tubing wall is thinner AND its corrugated design offers greater surface area. We also offer brazed plate heat exchangers if required by the system.